GERMANY: Despite a strong fourth quarter, Nordex's turbine order intake for 2017 fell 22% year-on-year, due in part to slowing business in Europe. A sluggish first nine months of the year meant its order intake for the year totalled 2.74GW — a fall of nearly 22% compared to the 3.5GW it recorded in 2016. In the fourth quarter of the year, the Nordex group received firm orders for almost 1.6GW — an increase of 12.5% compared to Q4 2016. The manufacturer described fourth quarter performance in North America, from where it received orders totalling 1,045.2MW, as "strong". At the end of the year, Nordex won contracts to deliver 820MW of turbines for three unnamed projects in the United States from two unnamed companies. 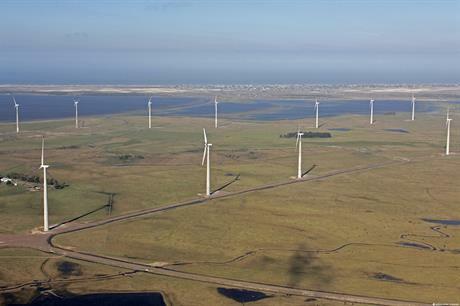 Nordex was also chosen to supply Vattenfall’s 180MW Wieringermeer project in the Netherlands in November, and in October it was selected for developer Genneia’s 101.4MW Pomona site in Argentina. The manufacturer’s North American orders accounted for 38.1% of its total order book, up from 23.6% the previous year. New business in Europe totalled 1.1GW for 2017, contributing to the region’s share of 39.9%, down from 50.1% in 2016. Beyond North America and Europe, the manufacturer was awarded 601.2MW of order intake in 2017 — down from 920.6MW a year earlier. In November, the company blamed a drop in orders for a 10.8% fall in earnings before interest, tax, depreciation and amortisation (EBITDA) for the first nine months of 2017.